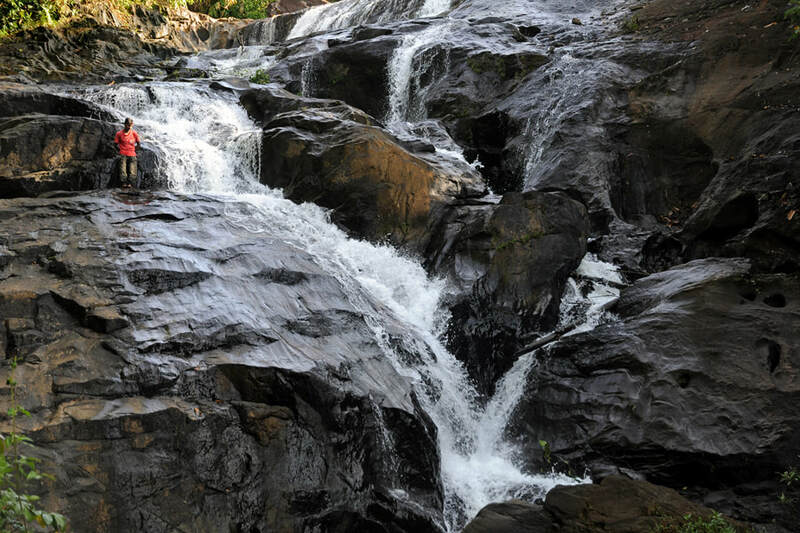 Kuruwita is a town 13 km north of Ratnapura is famous for a picturesque waterfall called Bopath Ella, which is a popular weekend destination for residents from the metropolitan area of Colombo, which is in 75 km distance. The most significant temple of Kuruwita is Delgamuwa Viharaya, also spelt Delgamu Vuhara. This temple was once the hiding place of the national palladium of the Sinhalese, the Sacred Tooth Relic, when the Portuguese tried to destroy it. From Delgamuwa, the Tooth Relic was finally transferred to Kandy. Two famous finding places of the prehistoric Balangoda culture are in the vicinity of Kuruwita, namely Batadomba Lena and Batatota Lena in 5 resp 9 km distance. The latter cave has been identified as the ancient Divaguhawa, which is mentioned in the Mahavamsa ar one of the Buddha-visited places of the island. The places just mentioned, though well known among Sinhalese people, are less frequented by foreigners. However, for those travellers planning to stay in the area to the southwest of Adam’s Peak, Kuruwita is a considerable alternative to Ratnapura, the nearby provinvcal capital of Sabaragamuwa. The Delgamuwa Raja Maha Viharaya is situated 1,5 km west of Kuruwita’s main junction by road. The buildings of this typical Buddhist temple are modern. But the place of the Delgamuwa temple, once calso known as Saparagamu Viharaya or Labujagama Viharaya, has been a sacred site for centuries. Its recorded history goes back to the time period of Sitawaka kingdom, which was the main rival of the Portuguese-controlled Kotte kingdom in the 16th century. The Delgamuwa temple is surrounded by cultivated fields now, but historically the name “Delgamuwa” refers to a jungle, it translates to “thicket of breadfruit”. Delgamuwa has a kind of Tooth Temple. Usually, the existence of former Tooth Temples indicates that the place was a former capital. That‘s not the case in Kuruwita or Delgamuwa. The history of the Delgamuwa temple is not that of Tooth worship at a royal court but that of a hiding place. The actual Tooth Temple of the early 16th century was in the most important Sinhalese capital, Kotte, which is in short distance from Colombo, which became the most important Portuguese stronghold on the island. De facto, the Portuguese were in control of Kotte, too. The Sinhalese king Dharmapala of Kotte was their puppet, we was baptized, his Christian name was Don Juan. Non-Christian sanctuaries in the areas controlled by the Portuguese were systematically destroyed. On order of the Bishop of Goa, the Sacred Tooth of the Buddha was stolen by the Portuguese and shipped to Goa, where it was publicly squelshed and pulverized and the powder burnt and the ashes thrown into the river. This happened in 1561. Faithful Sinhalese Buddhists, however, tell a different story. The custodian of the Sacred Tooth Relic, Hiripitiye Divana Rala, was warned when an old man in white garments appeared in front of him asking him to remove the relic for safekeeping in the centre of the island. In 1549, the custodian swam across the Diyawanna Oya and took the Tooth Relic to Sitawaka, nowadays Avissawela, to hand it over to Mayadunne, the mighty king of Sitavaka, who was the archrival of Kotte and the Portuguese. Mayadunne was glad to receive the national palladium of the Sinhalese. But he thought that the Sacred Tooth was not save enough in his capital Sitavaka, modern Avissawela. This is why he ordered it to be transferred to a place further south, farer away from the Portuguese. 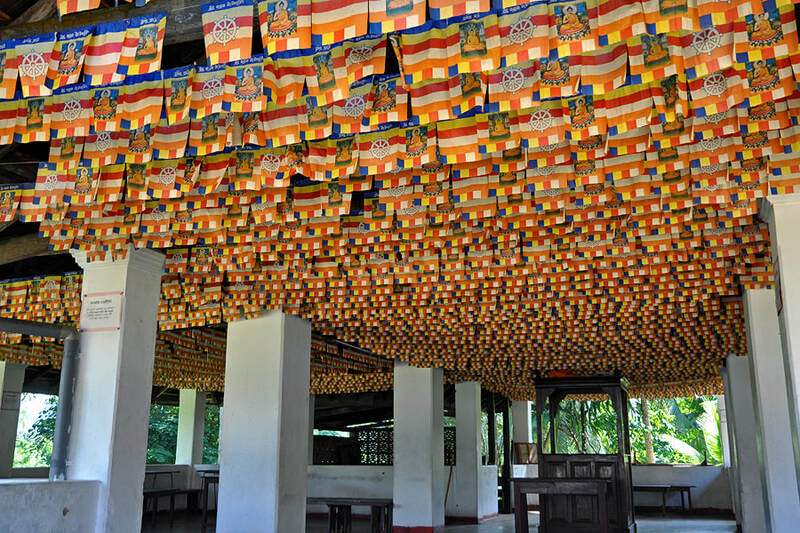 This place was the Delgamuwa Rajamaha Vihara near Kuruwita, then known as Sabaragamuwa monastery. The chief priest of Delgamuwa, Venerable Shatbasha Parameshwara Mahindalankara Thero, foresaw that the fanatic Christian iconoclasts would attempt to gain the Tooth Relic sooner or later. This is why he ordered to make ivory copies, one of which was brought to Sitavaka. When the Portuguese managed to capture Sitavaka for a short period, they came into possession of this copy and wrongly believed it to be the original. Hence, it was the copy and not the Sacred Tooth that was transported to Goa and destroyed by the Christian fanatics, who had ar already built a Catholic Church to replace the Tooth Temple in Kotte. The chief monk of the Delgamuwa temple continued to be worried that somone could find out the truth and inform the Portuguese who then would come to Delgamuwa to forcefully abduct the genuine Tooth Relic. This is why he took another precautionary measure. He ordered the manufacturing of a huge millstone with an angular shaped hole in the lower stone as a trunnion and a round hole in the grinder, just big enough for the casket of the Sacred Tooth. 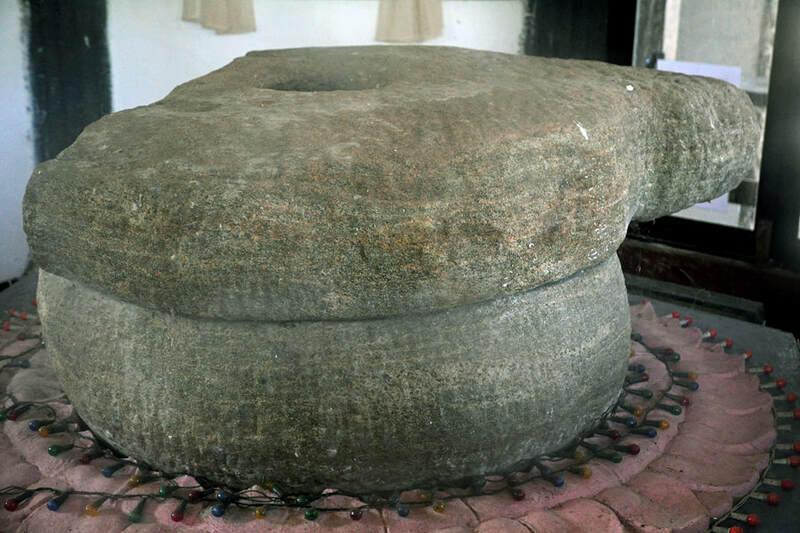 The millstone wasplaced behind a Buddha statue and stowed the relic in safe custody for more than 40 years, despite several abrupt search parties conducted by Portuguese soldiers. Afterwards, it was transferred to the Maha Saman Devale near Ratnapura by Mayadunne’s son, King Rajasinha, and finally from there to Kandy by King Wimaladhamsuriya I. The Sinhala word for millstone is Kurahan. Kuruhan is the name of the hiding place of the Sacred Tooth Relic in Delgamuwa. The Kuruhan of Delgamuwa once carrying the Buddha’s Tooth has become an object of worship itself. The huge Kuruhan is niw kept in a separate shrine of the temple, where it can be circumambulated like an idol. The tale of the journey of the Tooth Relic is vibrantly illustrated in the shrine room called Viharage. The Bo-tree of the Delgamuwa Rajamaha Viharaya is said to be over 800 years old. 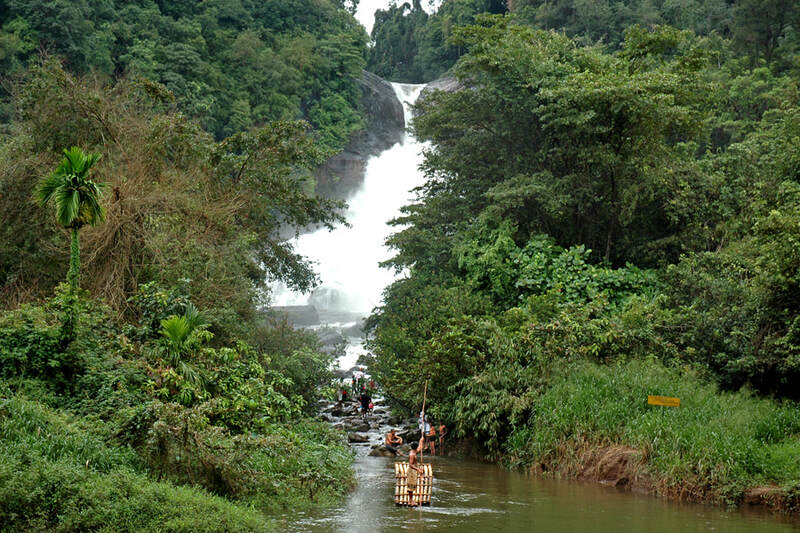 The waterfalls in the immediate surroundings are the main attraction for tourists coming to Kuruwita on their way from Colombo to Ratnapura. The waterfalls of Bopath Ella are located in a village named Agalwatte 3 km north of Kuruwita’s main junction. The name “Bopath Falls” refers to the distinctive shape, which resembles the leaf of a Bo-tree. The water first flows through a narrow gap in the rocks and then, bouncing on a level rock surface, sprays and widens. Bopath Ella is 30 metres high. It is formed by the namegiving river of Kuruwita, the Kuru Ganga, which is a tributary of the Kalu Ganga. The virgin forests along the upper reaches of Kuru Ganga are famous for their biodiversity. The river’s mean rate of flow at the Bopath Falls is 6 square metres per second. But after heavy rainfall the amount of water can increase drastically within a very short period of time. Fatal accidents occured at the rocky river banks below the Bopath Falls due to such sudden floods. Kuruwita, located at the southwestern slopes of Sri Lanka’s highlands is one of the areas with highest precipitation in Sri Lanka. Most water rainfall of course occurs during the southwest-monsoon season in northern summer months. The average annual rainfall is about 5,000 mm. There were attempts of private enterprises to use the natural incline for generating hydroelectricity. Such projects threaten many of the island’s waterfalls. For example, Sri Lanka’s Victoria Falls disappeared at the bottom of the Victoria reservoir. And St. Clair’s Falls, known as “Sri Lanka’s mini Niagara”, as well as Diyaluma Falls receive much less water than previously due to recent hydroelectricity projects. In the case of Bopath Ella, the project turned out to be uneconimical. Bopath Ella is now a protected area. Bopath Ella is surrounded by legends. 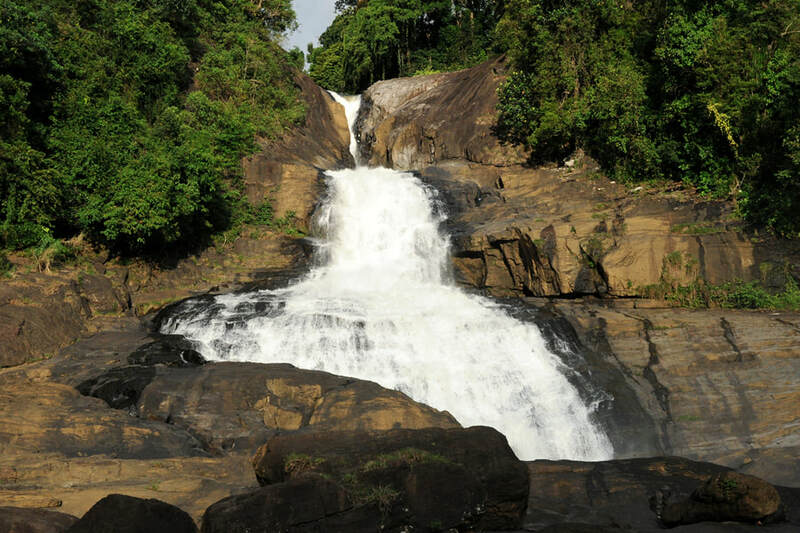 The legends of Bopath Ella are among the oldest folk tales referring to waterfalls in Sri Lanka. This might be due to the fact that the waterfalls in the area of Adam’s Peak, which a focal point of ancient tales. The mountain god of this area, the protector of Siri Pada (Adam’s Peak) is believed to have appeared at the waterfalls, when the place was visited by the entourage of the king of Sitawake. 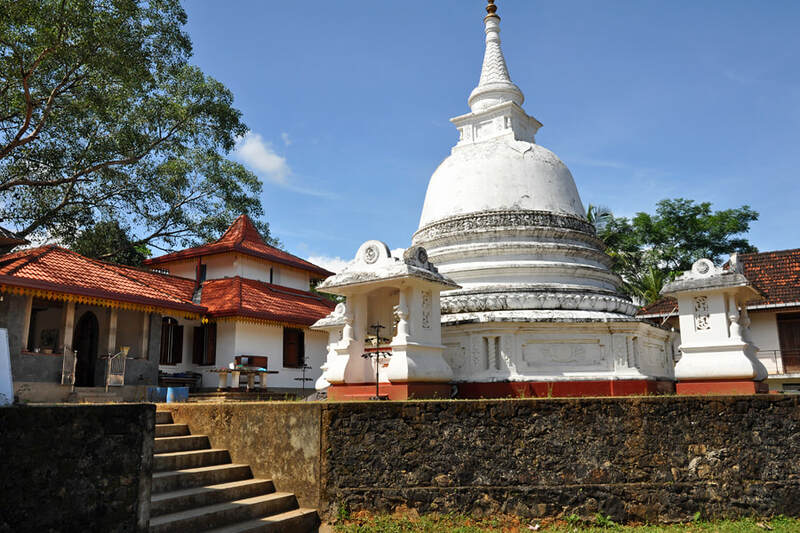 The royal family of Sitavaka used to go on pilgrimages to Saman’s shrine known as Mahasaman Devale, as this is the main temple of this southwestern inland area known as Sabaragamuwa, the guardian deity of which is Saman. The servants of the royal family carried with them a golden vessel containing the holy garments to adorn the idol of Saman in that shrine near Ratnapura. The river below the waterfalls has been the bathing place of ancient rulers, when they were on a pilgrimage tour to the nearby Mahasaman Devale of Ratnapura. Travelling along the the Kudu Ganga near the Bopath Falls, they took a refreshing bath in the river and left the golden receptacle at the foot of a sacred Na-tree. But after returning to the tree they could not to find the golden vessel and the garments at the tree. Searching it, they saw the gold of the receptacle shimmering in the water of the river. But whenever they attempted to catch it, it disappeared again and again with the movements of the water. Finally, they understood they were seeing only the mirrorin of the shimmering golden receptacle, which was actually placed atop the tree. It was Saman himself who had taken his clothes. This is why the place was names Devi-Pahala, which translates to “deity’s apparition” or “god’s manifestation”. Similar to legends surrounding Kirindi Ella and other waterfalls, an ancient treasure trove is said to be hidden in the waterfall or the pools below it. However, it’s not easy to find it, as one thousand human sacrifices would be required to come into its possession. Furthermore, Bopath Ella is said to be haunted by the ghost of a local girl, who had killed herself for love by jumping down the waterfalls. She had helped a pilgrim from Colombo, who had lost his way. When she guided him find his way, they fell in love. He left her pregnant and promised to return to marry her but never did. According to this popular belief, the ghost appears as a blue light at the Bopath Falls. 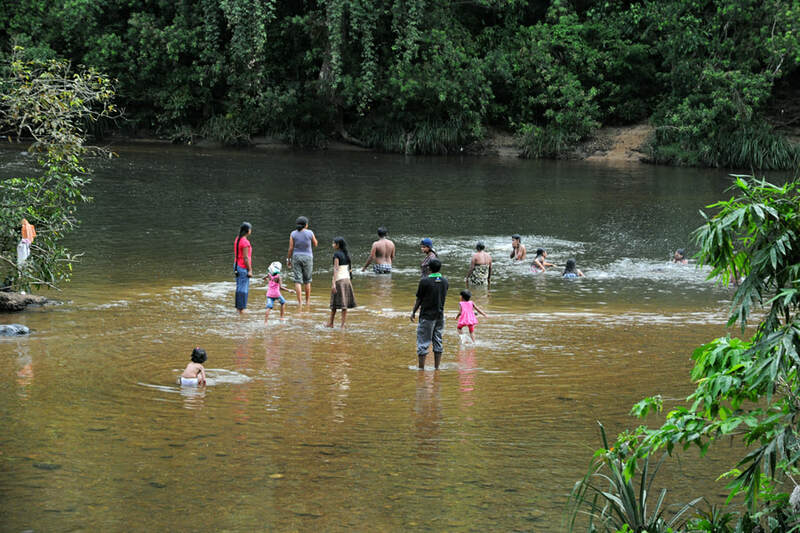 Due to the weekend visitors arriving from Colombo, who like to enjoy a picnic at the river banks or swiming in the calmer waters of the Kuru river, accommodation and small restaurants are available close to the Bopath Falls. The 300 m long path from the visitors’ car park to the riverbanks below the waterfalls is flanked by numerous stalls. Two kilometres further north, formed by another tributary which enters the Kuru Ganga just below the Bopath Falls, are the waterfalls known as Dodam Ella. They are rarely visited and not easy to reach without leech attacks. Altogether, the several cascades are 53 m in height. The name of the waterfalls is pronounced “Dodang” and translates to “orange”.